Grilling pizza is faster, easier and tastes way better than using a conventional oven when making pies at home. I love Indian food and hubby’s a Jersey boy who loves pizza. Today’s goal was to unite the two ideas and birth a unique and delicious spin on not only robust Indian flavors but also give a new face to the old faithful pizza. I did this the “fast” way tonight. I bought a pre-made crust and used a pre-made Indian curry in the jar, but of course you can always make your own. Maybe try something like the Tikka Masala sauce I made in a previous recipe. 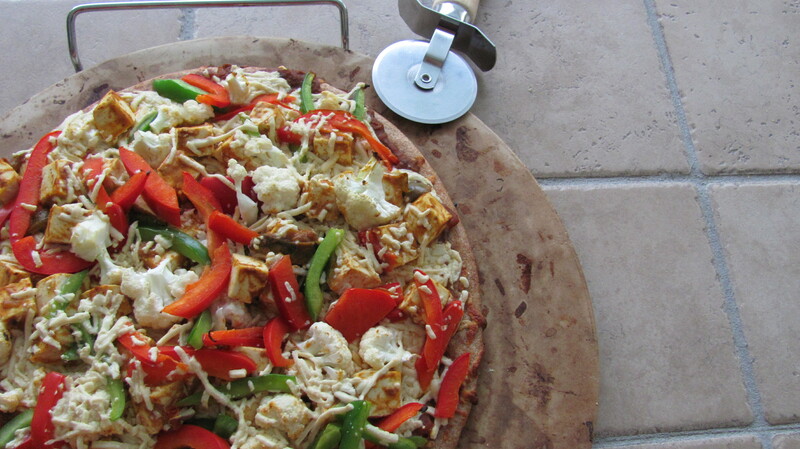 The cauliflower was actually really good on the pizza. I’ve tried it roasted it before with a little curry powder on it, so it wasn’t all that surprising it made for a tasty pizza topping. Wow your guests at your next summer barbecue, first of all, by saying that you are going to grill a pizza, and secondly, delight their taste buds with the exotic flavors of India. On a pizza. Cube tofu, then marinate in 1/2 cup Jalfrezi Curry Sauce and unsweetened soy milk for at least 30 minutes in the refrigerator. Heat grill to medium heat (400-500°). Once tofu is marinated, take remaining 1 cup of curry sauce and spread onto pizza crust, followed by most of the Daiya cheese (leave a little to sprinkle on top of the rest of the toppings). 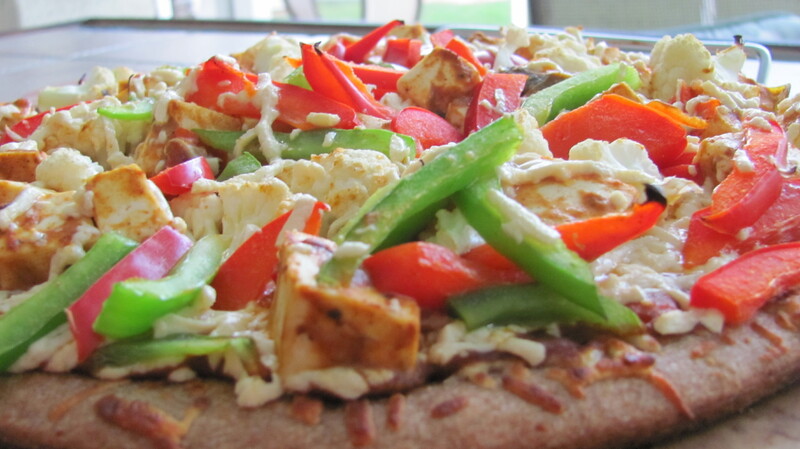 Add peppers, tofu and cauliflower and then sprinkle with rest of Daiya. Carefully transfer pizza onto the grill using a cutting board and large spatula (careful not to melt the cutting board to the grill if it’s plastic. That would be a hot mess!). Close grill and let it go for no more than about 12 minutes, or until veggies are soft and Daiya is ooey, gooey and melty. Careful not to burn the crust – the grill is a much different animal than the oven! Garnish each slice with fresh cilantro or chopped green onion.